Malainadu Divyadesam.. (at Kerala) “Thirumoozhikalam”.Sri Lakshmana Perumal temple …..
Out Of the 108 Divya desams, 13 divya desams are categorised as Malai Naatu divyadesams. (Kerala Divya desams), even though 2 of those 13 divyadesams are in Tamil Nadu today. Malai nadu divya desams are classified due to its location mostly located in Kerala that are scattered from North to South Kerala. North Kerala:– Thiruvithuvakodu near Pattambi and Thirunaavai near Kuttipuram can be accessed along with Guruvayur. 1) Thiruvithuvacode:– popularly known as “Anjhu murthy kovil” on Shoranur-Kallikatai rail route. Bus from Pattambi to Kootupatha ( app one hour bus drive) and from there to take an auto to go to temple. Central Kerala:– Thirumoozhikalam,Thirukatkarai near Ernakulam; Aranmula, Thiruvanvandoor, Thirukodithanam, Thirupuliyur, Thiruchenkundroor (popularly known as Pancha Pandava prathista temples) and Thiruvallavaazh can be accessed from Chenganoor. South Kerala:- Thiruvananthapuram and the 2 malai nadu temples in Tamilandu namely, Thiruvataaru and Thiruvanparisaaram can be visited together. The Lord who graced Sri sooktham (Thiru mozhi) to Sri Haritha maharishi and who is fondly addressed as “Appan” by Swamy Nammazhwar and as “lord of devas” by Tirumangai Azhwar gives darshan on the banks of Bharatapuzha river as Sri Sookthinathar/ Thirumoozhikalathan in this Kerala divya desam which is 12 kms from Alwaye in Ernakulam-Thrissur route. Lord Srisuktinathar (also glorified as Thirumozhikalathaan) gives darshan in standing posture facing east under Soundarya vimanam. Lord holds sankhu in HIS upper left hand and Prayoga chakram in upper right hand, HIS lower left hand placed on HIS hip and holds gada with HIS lower right hand. The Lord adorned with a silver kavacham, attracts all of us with HIS smiling face and benevolent glance . The Goddess Maduraveni Thayar adorns Perumal’s thirumaarbhu(chest).There is no separate sanctum for Thayar . The theertham is known as Sankhu theertham named after Bharata who is an amsam of Shankhu and also as Perunkulam as Lakshmana who is considered as Adiseshan had bath and as Chitraaru as it is a small stream. This temple was constructed by Lakshmana swamy to atone for the sin of suspecting his brother Bharatha . As he committed this unknowingly under a saints advise he constructed this temple and hence the temple is more popularly known as “Lakshmana Swamy temple”. Likewise, the divyadesams around Chenganoor are popularly known by the names of Pandavas as they were instrumental for constructing them. Athputha Narayanan temple at Thirukodithanam as Sahadeva temple..
On the left side of the sanctum while circumbulating, we see a small door with no deities inside it. It is believed that Lord SitaRamar are being worshiped there by Lakshmana Swamy for whom Lord SitaRamar was everything. For Lakshmanaswamy , Lord Srirama was “Unnum sorum, parugu neerum, thinnum vetrilaiy “. The priest accepted our plate of offerings and carefully adorned the Lord with the vastram and performed archana to the Lordships along with our yatra deities- Guruvayurappan, Sri Sitaramar and Swamy ramanujar. 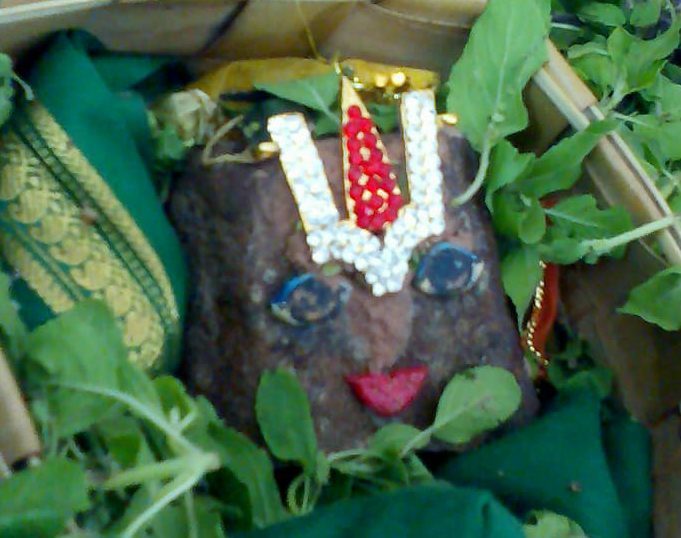 While distributing chandanam and tulasi prasadam, the priest informed that during Karkataka maasam (Aadi in Tamil-July-Aug), utsavam is performed in a grand scale. Makara masam utsavam is also performed in a grand scale. The deities of Lord Srirama, Lakshmana,Bharata and Shatruguna which were worshipped by Lord Krishna during Dwapara yuga got lost during deluge after Lord Srikrishna’s descent to Vaikuntam. These idols were later found by fishermen who approached the Namboodris for advise. As per the astrological calculations, these idols were installed at the above four places- Srirrama at Thriprayar, Bharatan at Inranjalakudi, Lakshmana at Thirumoozhikalam and Shatruguna at Payammal. It is usual practice for devotees to recite entire Srimad Ramayanam during Karkataka maasam and do “Naalambalam”(circumbulation of four temples) – most prevalent practice in Kerala where parikrama around all the four temples dedicated to Lord Sriramar at Thriprayar, Bharatan at Iranjalakudi (Koodalmanikyam temple) Lakshmanar at Thirumoozhikalam (Sri sukitnathar), and Shatruguna at Payyammal in a single day starting from Thriprayar Ramar temple is done. Lakshmana swamy as per the instructions of Lord Rama , while travelling in incognito to find out the welfare of the citizens reached this place and met the great Haritha maharishi. The rishi reminded him of suspecting Bharata’s motives while he was serving Sita-Ramar in Chitrakoot. He advised Lakshmana to continue to stay in this place and offer worship to the Lord for atoning his sins. Thus , Lakshmana constructed the temple and made all arrangements for worship of the Lord. Meanwhile, Bharata who had also set out for the same purpose of knowing the citizen’s opinion reached this place. The repentant Lakshmana sought forgiveness from his elder brother,Bharata. Bharata who is an embodiment of all virtues embraced Lakshmanaswamy saying that he had the good fortune to serve their elder brother,Sri Ramar in exile. As there was sweet exchange of words between brothers, the place came to be known as “Thiru mozhi kalam”. Nammazhwar has composed 10 pasurams on this Lord in Thiruvaimozhi 9-7. He takes the role of Parankusa nayaki(the female mood of a devotee) and exhibits his suffering from pangs of separation and sends clouds/ cuckoos, swans, storks, herons as messengers . Parankusa nayaki sends bees as messengers and requests the bee to utter her name in Perumal’s ears who always wears Tulasi garland and remind HIM of her while HE is enjoying with HIS consorts at Thirumoozhikalam. Nammazhwar emphasises acharyar sambandham (messengers in this case) who recommends us to Perumal in Thayar’s presence. By referring to Tulasi, azhwar emphasises bhagavatha(Devotees) sambandham too. In other words, to attain Perumal, we need devotees’ association, acharyar’s intervention and Thayar’s anugraham. Nammazhwar opines that acharyars are non-different from Perumal. Perumal exhibited HIS quality of menmai, soulabhyam(one who is very soft and compassionate to the devotees)/ by making azhwar recollect of the happy days they had together. Nammazhwar states that all jivatmas are part of Emperuman’s thirumeni whereas my atma is antharangam for this Perumal who has resolved to stay at Thirumoozhikalam to take the atmas back to Godhead. Tirumangai Azhwar has glorified Lord in Peria Thirumozhi, Siriya Thirumadal and Thirunedunthandakam. 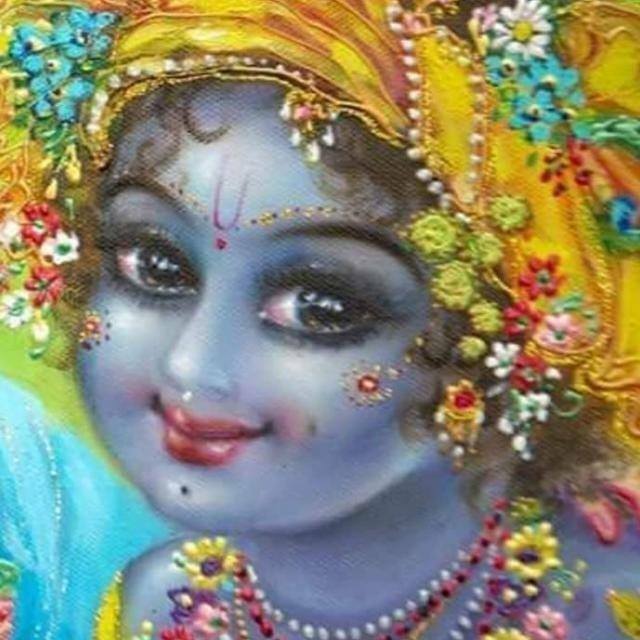 He addresses the Lord as the one who is as sweet as a nectar and a ripened fruit/ who is as beautiful as a coral necklace and who is ever ready to confer grace on HIS devotees. He addresses the Lord as the” light of Thirumoozhikalam “ in Peria Thirumozhi and Siriya Thirumadal. He compares the Lord to a light which dispels darkness. Similarly, this Lord dispels the darkness of ignorance . He refers to this Lord along with the Lord at Thirupiridhi(Joshirmutt) and his acharyar,Thirunaraiyur nambi. Another interesting fact is Tirumangai Azhwar has taken this Lord’s name while addressing his acharyar,Thirunaraiyur Srinivasa Perumal thus endorsing Nammazhwar’s view of Acharyar sambandham. In Thirunedundhandakam, ( pasuram no. 2061 -10th pasuram) Tirumangai Azhwar addresses the Lord as the protector of the Universe , devas and mortals like us, the Lord who saved the Universe from destruction and as the Lord who protects us like a mighty elephant from all four sides in the form of Srinivasar at Tirumala in the north, as Azhagar in the South, as Aramaudhan in the east and as Ranganathar in the west. In Siriya Thirumadal, pasuram 129, Tirumangai Azhwar declares he will fall at the feet of the Lord who is the head of devas and who is the light of Thirumoozhikalam. Divyakavi Pillai Iyengar who has composed one song on each of the 108 divyadesams in his work”108 Tirupati Andadi” glorifies this Lord as the Creator of the entire Universe, Sun,Moon, Shiva, Brahma, Indra and other devas. There is a small shrine for Paramasivan and while circumambulating the temple, we come across a very small shrine for little Krishna . Kannan wears a small peacock feather on HIS head and is seen holding flute in right hand. (3) 10 day festival during April-May starting on Hastam star and culminating on Thiruvonam day..
Sree: re thiruvithuvakkode, correct info as on 28.5.2018: from pattambi bus stand an auto to go to anjumoorthy temple and return to the same bus stand costs Rs. 150, This makes sense as otherwise we will struggle to return to pattambi. On entering the temple we have sannidhi for ganapathi and dakshinamoorthy, further go into main temple, we see kasi visvanathan and behind him, mahavishnuinstalled by arjuna. After worshipping here we see sannithi marked thayar sannithi, another one for Vishnu installed by bheema. From here we see the river bharathapuzha close by. Come towards exit we see a sannithi for Vishnu installed by yudhishtrar and one more installed by nakula and sahadeva together. SWAMIN, YOU ARE GIVING WONDERFUL AND VALUABLE INFORMATION ABOUT VARIOUS DIVYA DESAMS ALONG WITH OTHER TEMPLES SURROUNDING AREAS WHICH WILL HELP OTHERS DURING THEIR VISITS.